Direct thermal, 203 dpi, Serial/USB/Ethernet interfaces, EPL2 and ZPL II, Includes 6' USB cable, US Power cord. Direct thermal, 203 dpi, Serial/USB/Parallel interfaces, Cutter, Includes 6' USB cable, US power cord. Direct thermal, 203 dpi, Serial/USB/Parallel interfaces. Includes 6' USB cable. Direct thermal printer, 203 dpi, Serial/USB/Parallel interfaces, Dispenser. 6' USB cable and US power cord included. Direct thermal, 203 dpi, Serial/USB/Ethernet interfaces, Dispenser. Includes 6' USB cable. Direct thermal, 203 dpi, Serial/USB/Ethernet interfaces, Cutter. Includes 6' USB cable. Direct thermal printing, 203 dpi, 4" print width, USB/RS-232/Bluetooth interfaces, LCD display, Real-time clock, Adjustable Sensor. Direct thermal, 203 dpi, Serial/USB/Bluetooth interfaces. Includes 6' USB cable. Direct thermal, 203 dpi, Serial/USB/Wi-Fi (802.11b/g) interfaces. Includes 6' USB cable. 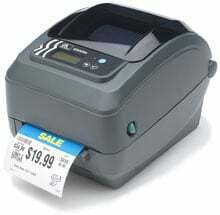 Direct thermal printing, 203 dpi, 4" print width, USB/RS-232/Parallel interfaces, Real-time clock, Adjustable Sensor. Direct thermal Printing, 203 dpi, USB/RS-232/Ethernet interfaces, Real-time clock, Adjustable Black line Sensor. Direct thermal, 203 dpi, Serial/USB/Wi-Fi (802.11b/g) interfaces, LCD, Cutter. Includes 6' USB cable. Direct thermal, 203 dpi, Serial/USB/Parallel interfaces, Cutter. Includes 6' USB cable and EU/UK power cord. Direct thermal, 203 dpi, Serial/USB/Ethernet interfaces, Cutter, Locking. Includes 6' USB cable. Great product, best label printer. We needed a dedicated label printer for UPS and FedEx labels and the GX420 was the perfect fit. Works flawlessly. I buy 4 or 5 of these at a time and deploy them throughout our plant. They are great for replacing the larger 140xII. I have 10 or 12 of these around the plant right now that have been up for months straight with no problems. The sales team at Barcodes Inc helped me pick these out and gave me a great price. We use these all over our warehouse and manufacturing facility and they are great. We used to buy the GK420 and external print servers (terrible plan) and then got a few of these and never looked back. This is a very reliable printer that we use to print and cut hundreds of labels each day. This is a great thermal printer. We are currently using 26 of these in our facility and rarely have any issues. Most print all day through at least 2 shifts totaling close to 20 hrs a day. All it seems we every have to do for maintenance is use a cleaning pen on the print head. All of our printers are setup to use the wireless network and perform flawlessly. I would highly recommend this printer.